One of the triumvirate of Frost programmes that dominated ITV weekends in the late 1960s and early ‘70s, Frost on Friday concentrated on current affairs – often creating the headlines, as well as reporting on them. Made at a time when David Frost was hosting a chat show in the US and then jetting back to the UK to do three shows over the weekend, Frost on Friday concentrates this energy into forty minutes worth of incisive and insightful commentary on current affairs as well as a number of remarkable interviews with often controversial, high-profile public figures. 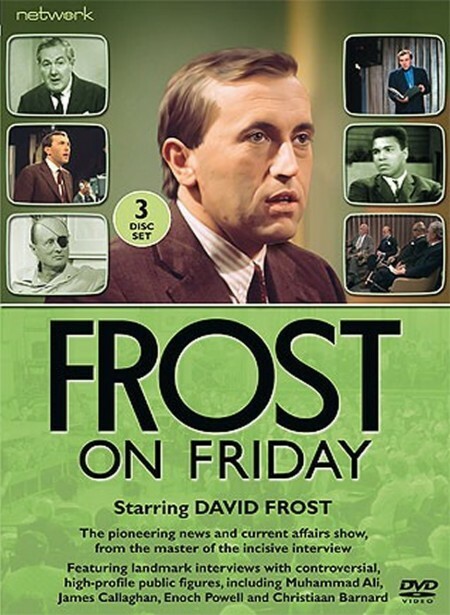 A number of editions of Frost on Friday no longer exist but of the shows remaining this set includes General Moshe Dayan discussing his role in the Six Day War, war criminal Baldur von Schirach on his relationship with Hitler, Cardinal Heenan outlining his position on contraception and a highly emotional interview with firebrand politician Enoch Powell. Muhammad Ali is interviewed in New York (during a period when he had been stripped of his title and boxing licence for refusing to be drafted into the Vietnam conflict) and James Callaghan gives a bullish and frank interview in his position as then-Home Secretary. A powerful debate on capital punishment includes contributions from the father of Derek Bentley – a teenager hanged for murder in 1953 (and pardoned three decades after this debate was recorded).